Facebook Style Wall Post Script with Expanding URLs. My previous post Facebook style wall post application. 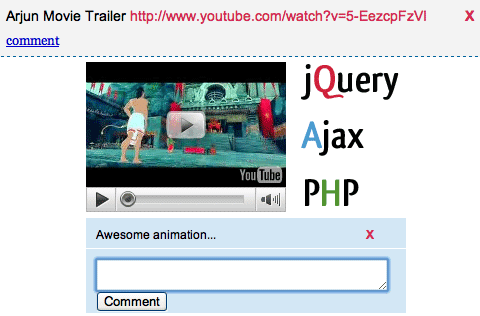 In this post I had updated some more features like expanding URLs to display videos. Take a look at this live demo. Download link is missing.When will you share this? After all its very useful after some customizations. btw how to make facebook chat tool bar to appear in all windows any idea ? Where is download link? I have emailed you, but no answer. I am a subscriber for the newsletter, but there was no link in email. I think oembed script is not working with ie. It works with firefox or chrome very well. why youtube didn't work to embed? may i know that source ? im student, i interesting about web script. Thank-you very much, very good script, but how to disable delete message on refresh or when closing broswer? with refress disappear because it not reads the mysql, this is the problem! Supercoooolll man! I need link.. pls! Nice Script... Share Link Please..!!! You have some nice tutorials here. I love them very much, but there's one problem, you don't give feedback on some of your tutorials. Like this one here "Facebook Style Wall Post Script with Expanding URLs". It cannot display data after you refresh the page, even though all the inputs are store in the database. Can you explain to us how to fix this problem. I'm just now learning PHP, I don't know how to make it work. If any can help please do so, cause I really wanna use that on my next project. Amazing script but IN SPITE OF the fact i have register my email on this website, i didn't get any email id and there are some script that i can't download. Can anyone that have this script working share it. It has+ this problem on Internet Explorer, and on page refresh everything disappear. I have been working night and day on this script, I just can't get it working. If you have this post work as it supposed to, please share the code with us. It will be greatly appreciated. I really would like to have this post on this project I'm woking on. Please post your working Code, or share the link of it. Thank you. are you facebook employer?..very good script.. When I insert text into db, there are no spaces? Thanks so much for making this available. Your efforts are much appreciated. I'm using this on the opposite side of the planet for an airpark community website. Thanks again! Hi, but in every page reload, the page goes blank, how can I, put fixed the update from other persons? Does anybody have the code to echo the comments from the database? What about add a counter with autorefresh? I think problem is word "&". Nice Blog and Post Brother.. This is exactly what I need, thanks!!! I subscribed yesterday but can't download.